SHERWOOD — Lauren Scarvie has a friendly smile. She's got a kind demeanor. And, at a lean 5-foot-8, she certainly doesn't have an imposing presence. Instead, the 2018 Sherwood High School graduate seems to be the type of girl that everyone wants as a friend. But, when the whistle blows, Scarvie likely is the type of girl that everyone wants as a teammate. While the friendly smile and the kind demeanor may still be there, that's when the competitor takes over. If there's a 50/50 ball on the soccer field, Scarvie is going to get it. If there's a loose ball on the hardwood during basketball season, you can count on Scarvie to dive for it to gain possession. "She is humble and unassuming and yet fiercely competitive," Sherwood High School girls basketball coach Wes Pappas said of Scarvie. "She leads by example through her hard work, determination and grit," Sherwood girls soccer coach Katie Hartman said. That competitiveness, determination and grit definitely showed during Scarvie's senior year at Sherwood High School. "It was a fun year," Scarvie said as she sat near the soccer field at the school. "It was so weird to finally be a senior. I remember when I was a freshman in basketball, the seniors were so big and strong. Now, I was a senior, and it was a cool experience. It was fun being a leader." And she turned out to be a crucial leader for both Sherwood teams. 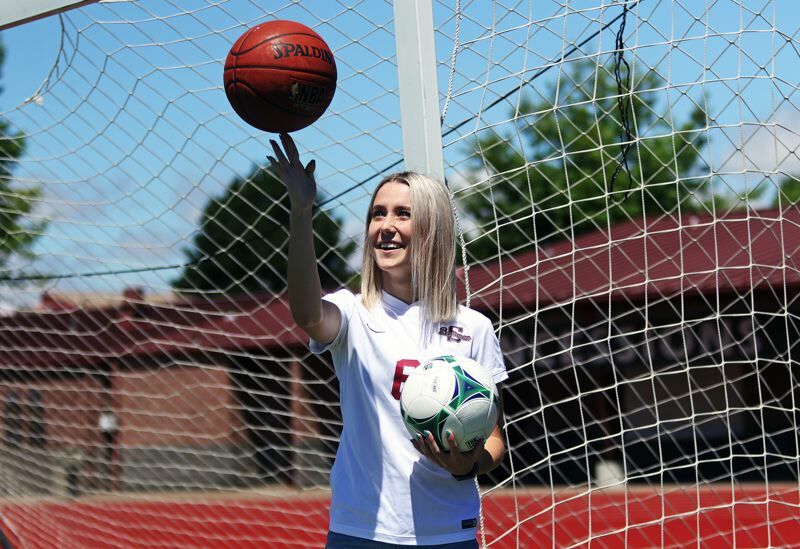 During soccer season, she helped the Lady Bowmen win the Three Rivers League championship and advance to the second round of the Class 6A state playoffs. "Lauren was a key leader for our team this past season," Hartman said. During basketball season, as a do-everything guard and the only senior on the roster, Scarvie helped lead Sherwood on an improbable journey, that saw the young Lady Bowmen squad come oh-so-close to earning a spot in the Class 6A state tournament. Scarvie's impact didn't go unnoticed, as she was a first-team All-Three Rivers League selection in both soccer and basketball, making her the first Sherwood athlete to earn first-team all-league honors in two sports since the school moved up to the Class 6A level. "That is just remarkable, in this league and at this level," Pappas said. "Whatever I say about Lauren will never be enough." Now, Scarvie has yet another honor, as she's been named the Times' Athlete of the Year from Sherwood High School. The honor goes to the top senior-class athlete, as seen by the Times, at Sherwood High School for the 2017-2018 school year. "It was a really cool senior year," Scarvie said. "The funnest things were the teams — bonding and getting to know new people. Sports is one of the things I'm really going to miss about high school." 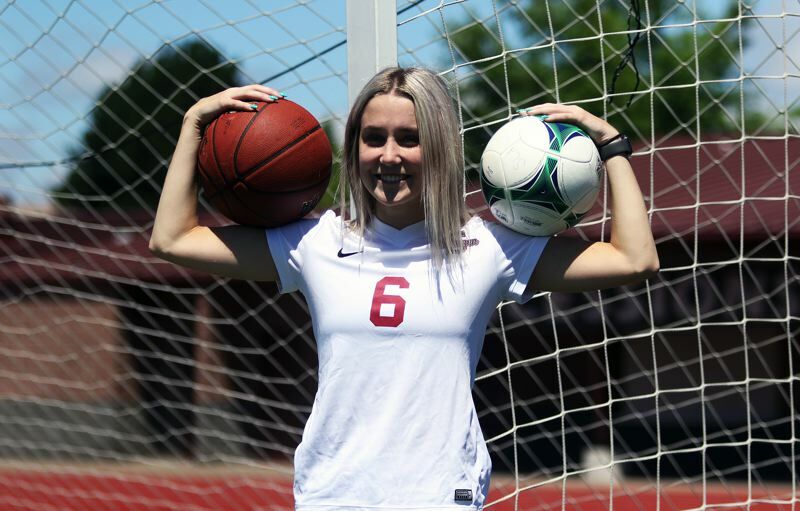 While Scarvie had a standout senior season as a midfielder for the Lady Bowmen soccer team, her biggest highlight may have came during her junior season, when she helped Sherwood win the Class 6A state championship. "That was super cool," Scarvie said. "The seniors on that team were so good. And I live for soccer. It was so much fun, and we were all so happy for each other." 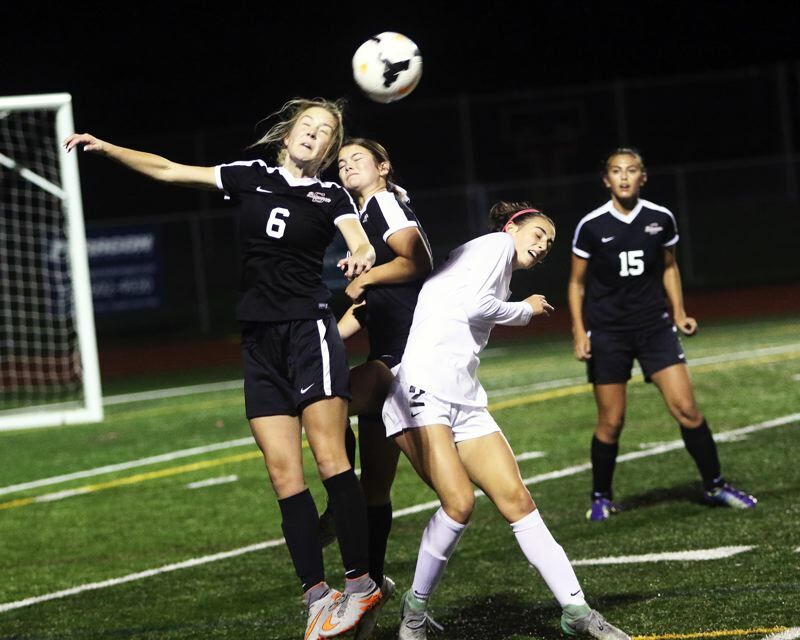 To make things even more special, the Lady Bowmen's 2-1 win over Sunset in the Class 6A state championship match fell on Nov. 12, 2016 — Scarvie's 17th birthday. "That was really cool," Scarvie said with a smile. "That was a really good present. That all has to be my biggest memory. Those last 10 minutes, everyone on the sideline was holding hands. I was so scared." Going into the 2017 girls soccer season, Scarvie was one of few returnees from the state championship team, as well as just one of six seniors on the Sherwood roster. "We had close to a completely new team," Scarvie said. "But I got to know the girls. Team bonding was crucial, and it turned out to be really fun. I'm sad it's over." But it was a successful finish. With Scarvie helping provide leadership — as well as determination and grit — the young Sherwood squad put together a 10-3-3 record, reaching the second round of the Class 6A state playoffs. The Lady Bowmen also went 6-0-2 in Three Rivers League play, claiming the league championship. Sherwood claimed the TRL crown with a 3-2 win at Tualatin in a regular-season finale. Scarvie had a corner-kick assist in the win, getting the ball to fellow senior Ashlyn Strohmaier. "It was the title game, and winning that was awesome," Scarvie said. "Winning that match was really big. It was one of our biggest opportunities of the season. It was a good one to end on." Scarvie, for her play in the 2017 season, was named a to the All-Three Rivers League first team as a midfielder. "It was a privilege to coach a player like Lauren," Hartman said. "I enjoyed seeing her growth not only as a player but as a leader throughout her four years in the program. I will miss Lauren's focus each time she stepped on the pitch. She showed up each day ready to conquer whatever challenge or opportunity was in front of her." For Scarvie, it was a quick transition from soccer to basketball. "I took just two days off," she said. "I was sad that soccer was over, but I was excited for basketball." Evidently so, as, even during soccer season, Scarvie was preparing for her senior basketball season at Sherwood. "We had this thing to make 5,000 shots, to get ready for the season," she said. "So I tried to balance all of that with soccer." As it turned out, Scarvie was ready to go. That was a good thing for the Lady Bowmen basketball team, as the tenacious guard was the only senior on the roster. "At the beginning of the season, I was scared," Scarvie said. "We lost three key seniors from last year, and I was intimidated that a lot would fall on my shoulders." As a junior, when she was an honorable-mention All-Three Rivers League pick, Scarvie was a defensive standout for the Lady Bowmen. She had to expand her game as a senior. "Pappas told me that I'd have to score more," Scarvie said. As it turned out, Scarvie did score more — and do more of everything. "She led our team in every meaningful category, including points, assists, rebounds, steals, field goal percentage, three-point field goal percentage and free throw percentage," Pappas said of Scarvie. "In 16 years of coaching high school basketball, I've never had a player lead the team in that many categories." But, as Scarvie points out, she didn't do everything on her own. "I think it was helpful that we were so young," she said. "We improved so much. A lot of girls really stepped up. (Freshman) Jane (Sandilands) really stepped up. At the end of the season, we were playing our best." One of the turning points of the season may have been on Jan. 30, when the Lady Bowmen hosted Canby. That night was Sherwood's senior night, or, as it could be called, Lauren Scarvie night. The Lady Bowmen bested the Cougars 39-36 that night. "That was really cool," Scarvie said. "We weren't supposed to win that game. I think it was a turning point. I think that we found out that night that a lot of people could contribute." 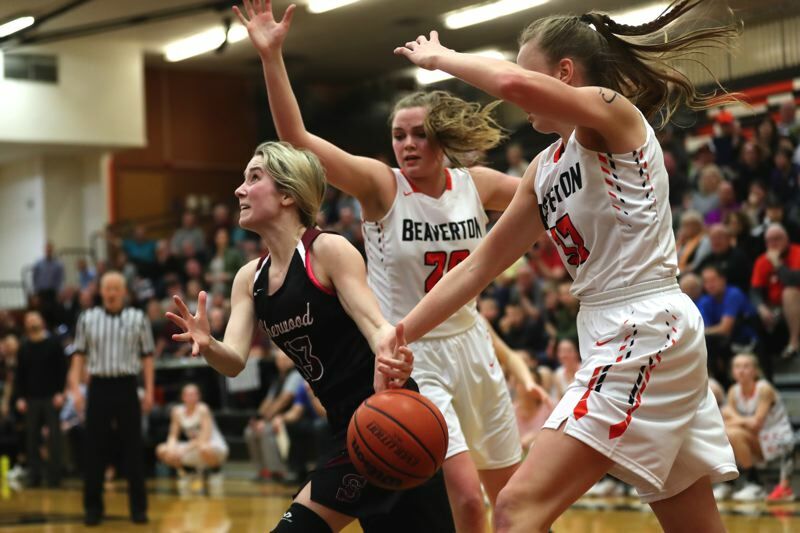 The Lady Bowmen, who finished the season at 13-13, went on to earn a spot in the Class 6A state playoffs, and opened postseason play by scoring a 22-20 first-round win at Forest Grove. Scarvie scored eight points in that game, tying junior Aubrie Emmons for team high, in the low-scoring win. "It was so funny. Everyone gave us crap for scoring so low in the playoffs," Scarvie said with a laugh. "Our strategy for the playoffs was that we weren't going to outscore these teams. We're known for our zone defense, and defense was our game plan." In the second round of the state playoffs, playing at No. 3 seed Beaverton, Sherwood held a 17-13 lead early in the third quarter, before the Beavers rallied to get a 23-18 win. "It was rough," Scarvie said. "But I thought we had a really good season." Scarvie was a first-team All-Three Rivers League selection for her play as a senior. "She is also a tremendous student, that finished with a 4.0 grade-point average, and is an even better person," Pappas said of Scarvie. "I've had the pleasure of coaching some fantastic kids over my coaching career but a finer student-athlete you will never find. Lauren was an absolute joy to coach for four years." Be it soccer or basketball, Scarvie was bolstered by a strong support group — mainly her family. "My parents (Rachel and Jeff Scarvie) have been so supportive," Lauren Scarvie said. "I remember when I played youth soccer, I'd go outside to practice juggling the soccer ball. I was so bad, but my mom would come out there and watch me for hours. My parents are there for everything." And, when she can, so is her older sister, Emily, who will be a junior at the University of Oregon. "Having my sister there to watch me during winter break was special," Lauren Scarvie said. Always one to keep striving, Lauren Scarvie will be attending the Robert D. Clark Honors College at the University of Oregon starting in the fall. "I'm really looking forward to it," she said. "But I'm going to miss Sherwood. There was so much support here, and so many nice people here. And, our student section was really intense at games. I'm going to miss it." Meanwhile, Sherwood is likely miss all of that competitiveness, determination and grit.